The COLE/TANNER Family Tree is dedicated to the research of the genealogy of the Cole and Tanner families of Greene Co., PA. It includes both my wife's and my families and currently has over 32 thousand individuals and dates back to the 12th century. In no way should anyone consider the information contained on this web site as fact, it is very much a work in progress and is displayed to hopefully meet other cousins and share information. Eddy Family Surnames: Eddy, Graham, Ammons, Huff, Wilson, Tennant, Carll, Mason, Stephens, Manross, Platt, Kuhn, Snider, Mason, Chew, Stull, Minor, Moore, Doughty, Hockenberry, Cotheal, Tomlinson, Miller, Lynch, Wgick, Haught, Scarf, Clegg, Brown, Woodruff, Babcock, Jameson, Edwards, Ruddell, Pearce, Finch, Wark, Phillips, Farmer, Miller and King. If you are related (or think you might be) and would like to access the data on this site, please register for an account on the left. Tell us a little about yourself and how you think you are related. If you feel there are any errors on this site or you have additional information, please let me know via the contact us link below or the suggest tab on the individual's page. Additional research is planned, so stop back occasionally if you think there may be a link between our family and yours. 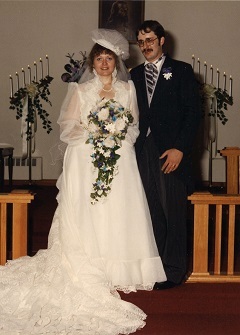 Wedding photo David L. Cole and Robin S. Tanner, October 12, 1985. The Cole/Tanner Family Tree - created and maintained by David L. Cole Copyright © 1997-2019 All rights reserved. | Data Protection Policy. Genealogy data can always be changing as new facts are found. Therefore, Always give the information in the Reference block on the Individual's page as your source for this information, not the individual sources listed.